Like trying to douse a fire with gasoline. Despite the current The Taken King controversy Bungie is undergoing, Activision and Red Bull have decided to announce their partnership, offering special content for Destiny. All players have to do is spend even more money. "This partnership brings two brands synonymous with adventure together to offer Destiny players a unique opportunity to further advance their Guardians in the Destiny universe. Whether a player is new to Destiny or with us since launch, the special quest promotion will help give them the 'wings' and experience boost to take on The Taken King." Starting on July 1st, players will be able to use the cans to obtain bonus XP. This one time consumable item allows player to rake up 50% extra XP for a 30 minute time period. While each code can be downloaded separately and held until used, only one Bonus XP buff can be used at one time. As for the special mission being offered, this won't become available until The Taken King expansion hits this coming September 15th. 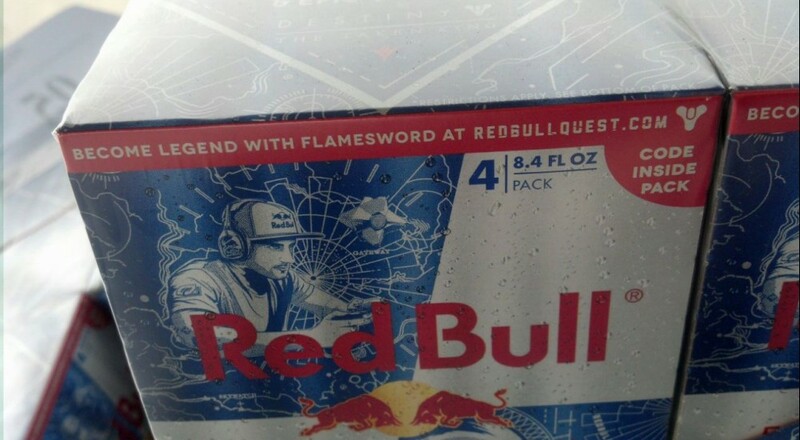 As of now, we don't have much info on the mission itself, just that it will be available to those that redeem the code found on these Red Bull cans. 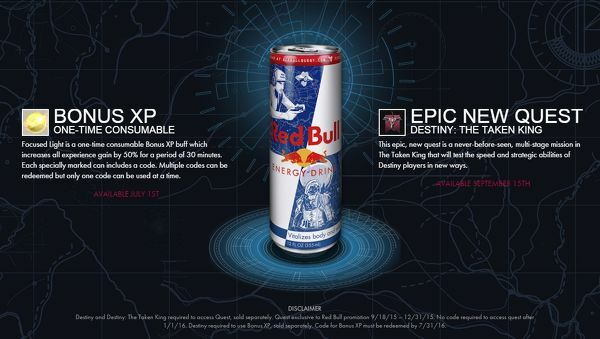 Closer to the launch of The Taken King, Walmart will be offering 4-packs of Red Bull with Mega XP Accelerator codes for extra XP gaining capabilities. Bungie's New IP Confirmed - Named "Destiny"